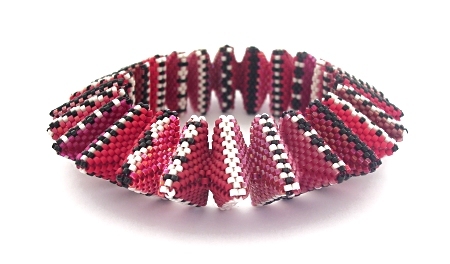 Learn how to make this bracelet which forms part of my popular and award-winning Geometric Beadwork series. This bracelet has been juried into the 2008 Wearable Expressions Exhibition in Palos Verde, California. It also won 2nd place in the bracelet category of the 2007 Bead Art Awards and was juried as a finalist in the 2007 Bead Dreams Contest. This complete 12 page step-by-step tutorial contains all the instructions, diagrams and photos you will need to make your own version of the bracelet.